England limited-overs spinner Stephen Parry has agreed a new long-term contract to stay at Lancashire. 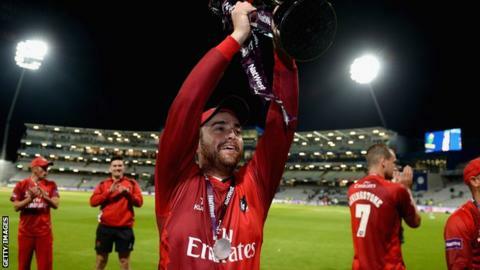 The Manchester-born 29-year-old was the joint leading wicket taker with 25 in the T20 Blast this summer as the Red Rose county lifted the trophy. Parry has five England caps and is currently with their T20 squad for the games against Pakistan in the UAE. He joins seam bowlers Kyle Jarvis, Tom Bailey and Gavin Griffiths in signing new deals at Old Trafford this week. "Stephen is a fantastic, international quality bowler and is also a great person to have in the dressing room," said cricket director and head coach Ashley Giles. "He's a person who embodies what it means to be a Lancashire player and his experience is of great benefit to the younger guys in the dressing room."